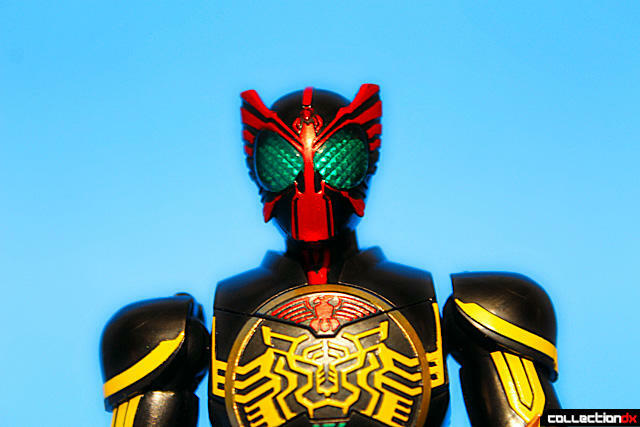 Kamen Rider OOO come from the Kamen Rider series of the same name: Kamen Rider OOO. 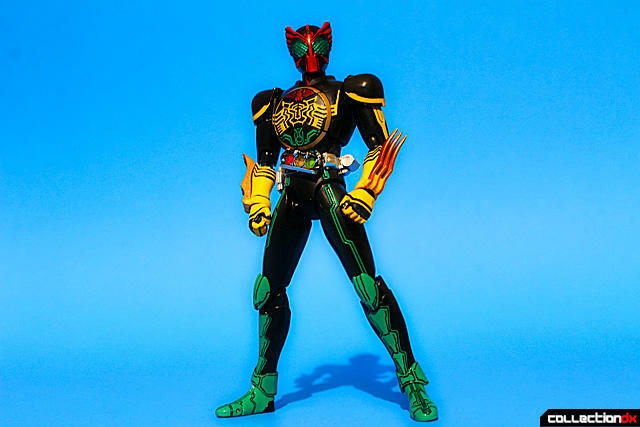 He made his debut in Kamen Rider W Forever: A to Z/The Gaia Memories of Fate. Today we're checking out his S.H. 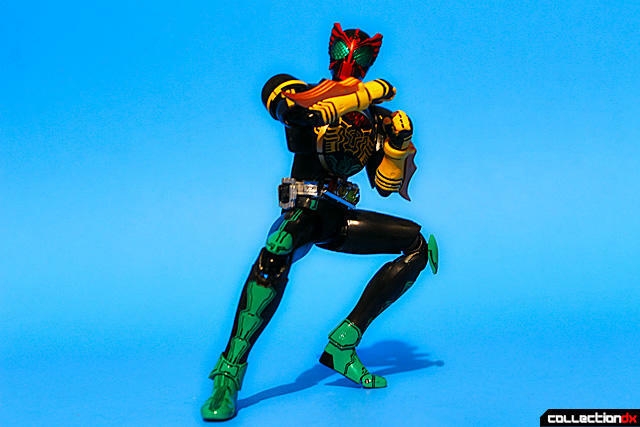 Figuarts TaToBa combo figure. This is my first S.H. 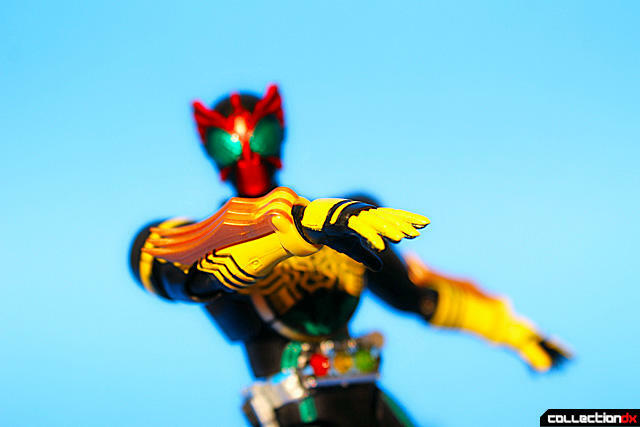 Figuarts review, but the figure is very reminiscent of Bandai's Ultra-Act line of figures. He comes in a small, slender box with a window front. The figure is laid out in a plastic tray along with his accessories. The figure has some very clean paint applications. The paint quality seems to be very good and there are no over-sprays or anything that detracts from the overall look. The figure feels nice and firm in the hands and it is immediately apparent that it is loaded with articulation. In the beginning of the review I mentioned that these figures reminded me of the Ultra Act figures (Ultra Acts seemed to be based of these basic body designs)and it's true. On his waist is the OOO Driver which is removable. The figure has some incredible articulation that allows freedom in posing. It is also well balanced as made evident in this picture. Little effort was required to achieve this pose that would topple lesser figures. The head has a very nice metallic red paint which doesn't take well to being photographed but believe me its nicer than it looks here. The eyes are transparent green with a segmented diamond shapes in the background to give it a nice feeling of depth. 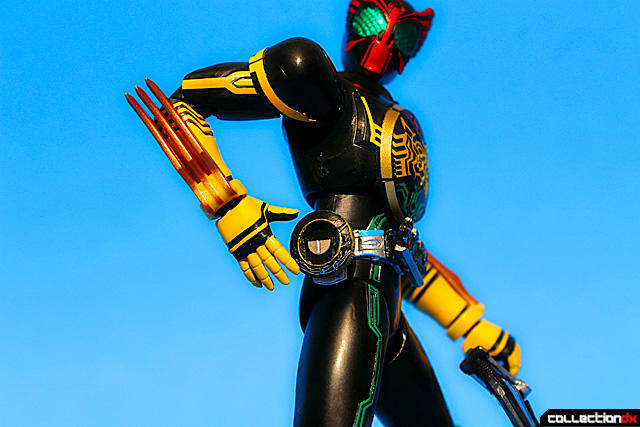 On his forearms lie the Tora Claw Gauntlets in their folded back positions. These do not move at all. 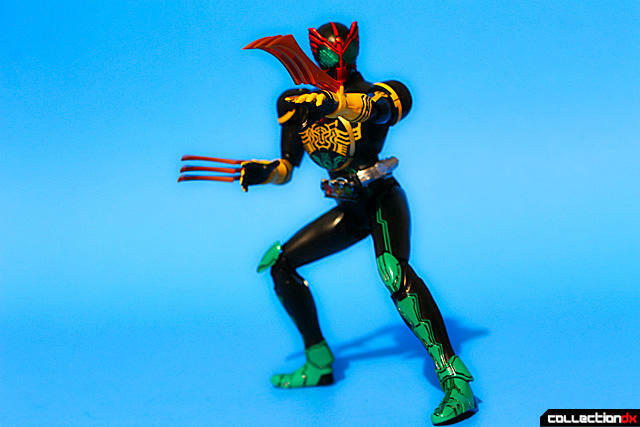 Fortunately, there are alternate Tora Claw Gauntlets should you choose to display him with claws exposed. This feature requires popping of the hands and swapping out the claws with the alternate ones. 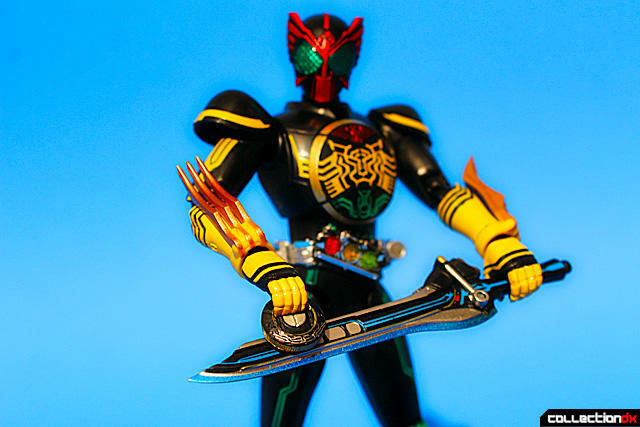 Kamen Rider OOO also comes with a small O Scanner which can be conveniently clipped to his side. Also included in the set is the Medajaribur or Medajalibur which is a combination of "Medal" and "Excalibur". Time for some scanning action! Overall for my first stab at S.H. 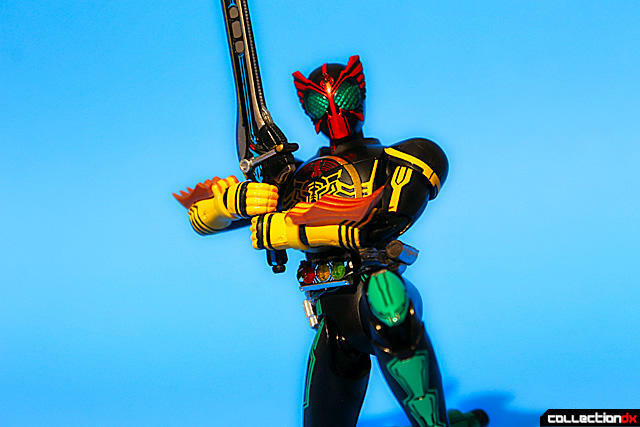 Figuarts, I was pleasantly impressed which is why this will not be my last. I love the design of OOO. Personally I'm getting the Combo Change figures, which can switch up the parts to make new configurations. The one thing this TaToBa lacks is the ability to change its legs into the grasshopper legs, which the Combo Change figure can do. I dont know why either, these figures are a definit downgrade from usual sh figuarts. No diecast and feet as you stated have reduced articulation. I like some of the designs in this series so i collect but the price of these didnt change but overall quality has for this entire line!! I also have no idea why they couldnt of had hinged claws for this. I can understand not having hinged claws. A huge hinge on a tiny joint like that could possibly be unsightly. What gets me is that the price HAS increased slowly but surely. 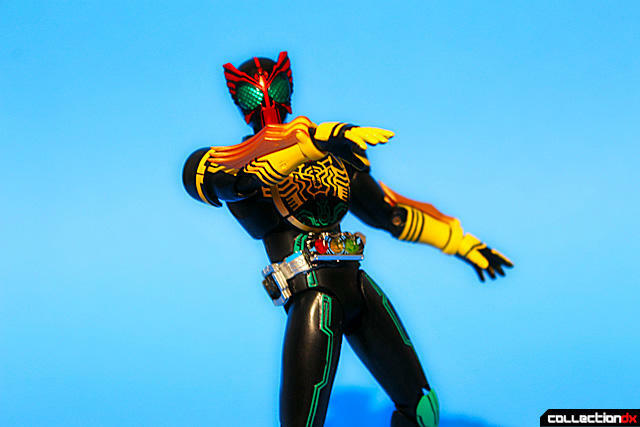 Most Figuarts tended to be 2500 yen when they first came up, with the bigger more fancy ones being around 3500. Now Almost all Figuarts are 3000 at least.